A double chin, referred to as submental adipose tissue in the medical world, can be a source of insecurity for both men and women, particularly as the body ages. If you are dissatisfied with the presence of excess fat under the chin, you are not alone. According a survey released by the American Society for Dermatologic Surgery in 2015, 67% of respondents mentioned a double chin as a top cosmetic concern. Until recently, it has been difficult to treat submental fullness without the aid of surgery. Kybella is a breakthrough minimally-invasive treatment that can reduce stubborn fat deposits under the chin and improve the contours of the jawline. At Noydeen Beauty in Conway, Arkansas, we are committed to offering the most advanced non-surgical cosmetic treatments available. As such, we are proud to offer Kybella treatments to our patients. Kybella has been FDA-approved specifically for the treatment of fat under the chin. It is used off label for other areas of the body such as the bra fat at the upper edge of the breast and arm (BraBella) and knee fat. Kybella is a revolutionary procedure that is safe and effective. Unlike liposuction, a fat removal surgery, Kybella injectable treatments do not require incisions or mechanical fat extraction. Instead, Kybella’s active ingredient – deoxycholic acid – breaks down submental fat so the body can eliminate it through its own channels. Deoxycholic acid is a fat-absorbing substance naturally produced in the body. When injected, Kybella dissolves fat cells and the dead cells are permanently swept away by the body. After a treatment, patients can immediately resume their normal activities. No downtime is needed. Best of all, Kybella treatments yield long-lasting results. The fat that is dissolved is permanently gone. Since its introduction, Kybella has become a popular treatment for those who wish to eliminate fat, but are hesitant to undergo surgery. After an injection, there may be some minor tenderness, swelling or bruising at the injection site, but these side effects are minimal and usually resolve themselves in a matter of 2-7 days. For optimal results, a series of injections is typically needed. Injections are usually spaced about 6 weeks apart, a period that gives the body time to process the fat waste. The number of injections needed will vary from individual to individual. Many of our patients see visible improvement after 2-4 treatments. Results can be permanently maintained, particularly if weight fluctuation is avoided. Many patients come to our Conway office frustrated by their inability to eliminate submental (under chin) fat, despite maintaining a healthy weight and balanced lifestyle. If you have moderate-to-severe submental fat and are close to your ideal weight, Kybella may help you reach your aesthetic goals. Although Kybella is considered safe and effective, it should only be administered by a properly trained healthcare practitioner. 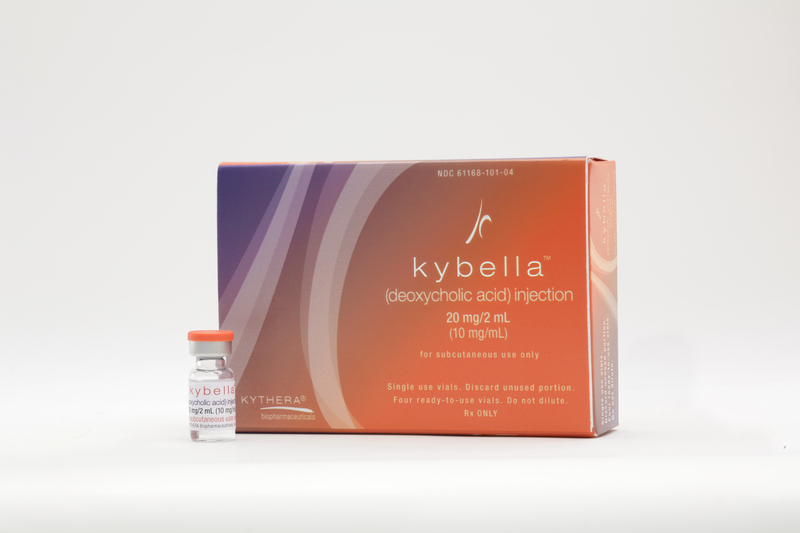 Kybella can be used on individuals who are 18 and older; however, it has not been determined whether the treatment is effective or appropriate for adolescents and children. If you live in Conway, make a consultation appointment and your practitioner at Noydeen Beauty can determine whether Kybella treatments are right for you.